Most of us learn about chemistry in high school and usually from a textbook, but that doesn’t have to be the only way. 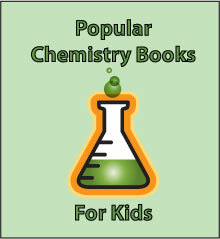 Children will enjoy learning about chemistry from these popular books. With short sentences and controlled vocabulary, this is an introduction to atoms for the youngest reader. What does a baseball and a birthday party balloon have in common? Although they are the same because they are both made of matter and take up space, young readers will also find out that they don’t have the same density. With only 151 words, this beginning reader book still manages define matter and explore the three states of matter: solids, liquids, and gases. As you can see from the cover, it is illustrated with big, colorful photographs. In a gently humorous way, this book introduces children to the idea the world is made of matter and that matter occurs in three states: solid, liquid, or gas. You can never go wrong with any of the Let’s-Read-and-Find-Out Science series books. Humor is also the target of the books in the LOL Physical Science series, but that doesn’t mean the science is not serious. For example, you can find out all about more advanced concepts such as friction and viscosity on page 16 in the book. Molecule Mayhem Pop-Up Chemistry Chaos by Tom Adams and illustrated by Thomas Flintham. The winner of the 2013 ALCS Educational Writers’ Award, this title from the UK combines the interactivity of pop-ups, pull tabs and booklets with the answers to some chemistry mysteries (“Why do onions make us cry?”) and suggestions for hands-on activities. Tested at the Ontario Science Centre, these 13 experiments exploring solids, liquids, and gases are sure to be hits with younger scientists. Illustrated throughout with bright, lively photographs. Make It Change! 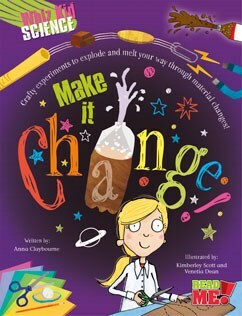 (Whiz Kid Science) by Anna Claybourne, and illustrated by Kimberly Scott and Venetia Dean introduces some easy-to-do hands-on chemistry activities that are sure to intrigue and inspire kids. Are these unique, groundbreaking experiments? No, you can probably find instructions for the twelve experiments that are included throughout the Internet. The difference is the instructions are clear, there are suggestions for troubleshooting, the science behind the experiment is revealed in a concise and accurate way, and suggestions for extending the activities are included. After a brief introduction to the periodic table, Arbuthnott delves into over 70 of the 92 elements.Common elements warrant a two page spread, whereas less common are covered in a page or less. Lively illustrations and photographs add interest. It is a good first introduction/overview. Don’t be fooled by the cover, this book really is written for older kids. Organized by chemical families, it introduces the everyday elements, such as boron, bismuth, and calcium and gives instructions for hands-on activities to explore them. There is some serious science hiding behind the less-than-serious cartoon illustrations. This book gives the instructions for 50 experiments kids can do with materials generally found around the house. In addition to explaining “What You Do,” each experiment is accompanied by a “Why It Works” section explaining the science behind it. Most of the experiments are classics, but there are a few fresh ones. Once readers have a good idea that everything is made up of the same 92 elements, they can flip through and find the elements that intrigue them the most. Wacky illustrations and blasts of humor make it easy to read. In this interesting project, 11-year-old Alexa Coelho came up with the questions and science writer Simon Field answered them. Readers can skip to questions that interest them, which is an added plus for reluctant readers. Those fascinated by chemistry, however, won’t be able to put it down. The books of the Horrible Science series try to be gross and irreverent, but many, like this one, turn out to be much more educational than crass. 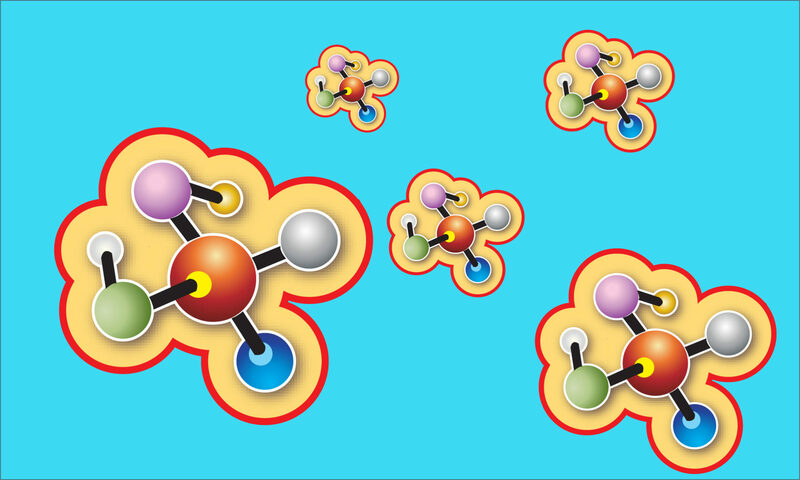 Chemical Chaos has history, facts and hands-on activity suggestions all rolled into one. The cartoon illustrations and sidebars are great for visual learners. Members of our family read it again and again. Chemical Chaos (Horrible Science) is also available in Kindle format. The layout of the text is clean and serious, with specific instructions for experiments and clear explanations of what is happening. Could be used with a range of ages. Starting with instructions for 47 interesting hands-on experiments and activities, the reader is then invited to expand them into science fair projects. Best for the beginner who needs to learn the scientific method. Although the cover has a gorgeous full-color photograph, the illustrations inside are black and white drawings. 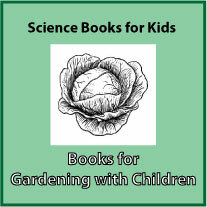 Do you know a child who is interested in science but finds the traditional nonfiction books a bit too tame and lame? Looking for something a little edgy with a bite of humor (“You have to keep your ‘Ion’ this bunch…”)? Then you might want to take a look at the Basher series science books. Each concept is illustrated in Basher’s unique style. Once again, Basher’s humor and first person narratives are not for everyone, but just might be the ticket for a reluctant reader. Do you have any favorite chemistry books? We’d love to hear about them! Disclaimer: Just so you know, I am an affiliate with Amazon. If you make a purchase after clicking on one of the title links, I will receive a small commission at no extra charge to you, the proceeds of which will help pay for maintaining this website. 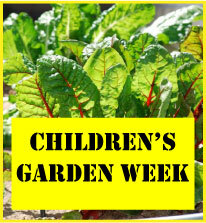 Below is a list of children’s books that focus on plants and gardening, organized by reading level and genre. They were chosen to support and inspire plant science projects. 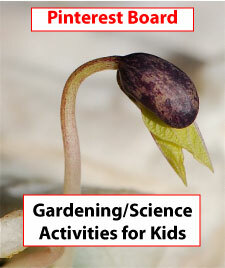 Be sure to visit our earlier list of children’s books about seeds, as well. Do you have any favorite plant science books for kids? We’d love to hear your suggestions. Note: Linked titles go to Amazon for further information and reviews. Just so you know, I am an affiliate with Amazon. If you make a purchase after clicking on one of the links, I will receive a small commission at no extra charge to you, the proceeds of which will help pay for maintaining this website. Don’t let the short sentences fool you, this informational book is full of vocabulary and concepts, such as what are roots, stems and flowers. Be sure to read the notes for parents and educators in the back to get the most from the book. Although they can’t run around like some animals can, plants can move quite a bit. Sunflowers follow the sun, tendrils can creep around, and seeds can shoot away. A deeper look into the life of plants. Flowers (Plant Parts) by Melanie Waldron is the perfect introduction to flowers in the garden. This informational book covers what a flower is, the parts of a flower, how flowers make seeds, and become fruit, etc. It also discusses how flowers attract insect pollinators. Two hands-on activities are included with clear and well-organized instructions to help reinforce learning. Seeds and Fruits (Plant Parts) is also by Melanie Waldron and is part of the same series as Flowers. It covers variation in seeds and fruits, what seeds and fruit are for, the parts of a flowering plant, how seeds are made, what’s inside a seed, what seeds need to germinate, different types of fruit, methods plants use to disperse seeds, and how humans interact with seeds and fruits. 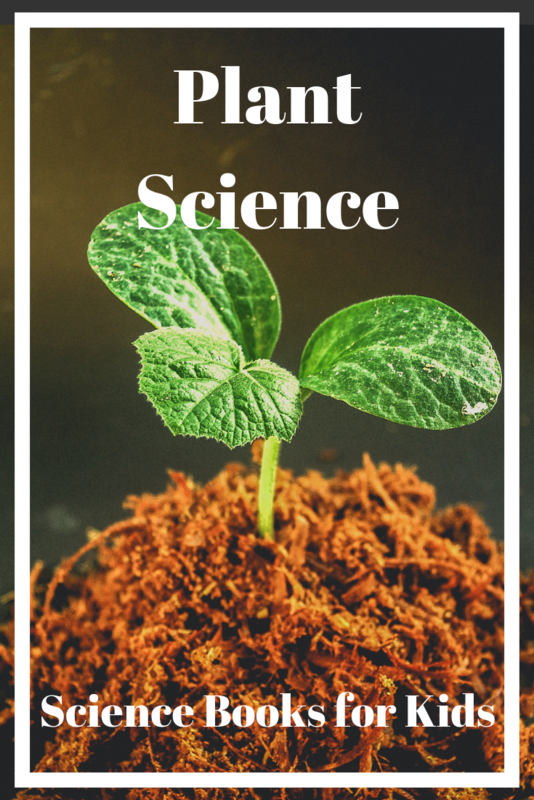 This book contains an activity of finding seeds in fruit and an experiment to investigate germination of bean seeds under different conditions. These books in the Plant Parts series would work well with a school garden as well as in the classroom for a unit on plants. Vegetables aren’t the only plants we can study. Weeds Find a Way by Cindy Jenson-Elliott and illustrated by Carolyn Fisher introduces young readers to the wonders of the natural world by exploring these often ignored, deplored plants. Jenson-Elliott’s text conjures up lighthearted word pictures. For example, can’t you imagine seeds coming out of pods “…like confetti from a popped balloon?” The back matter, however, includes a serious discussion of weeds, why they are interesting and important, and a list and descriptions of some common weeds.Pick up a copy and you will find out, as the author says, “Weeds are amazing!” (Review with activity suggestions at Growing with Science). 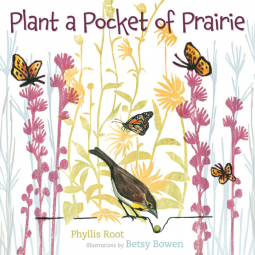 Plant a Pocket of Prairie by Phyllis Root and illustrated by Betsy Bowen is a perfect introduction because it encourages planting of locally-adapted plants in pocket wildlife gardens. The book may focus on the prairies of Minnesota, but it carries a message about preserving habitats that is important anywhere in the world. Get the full scoop at Growing with Science. This creative picture book walks the line between fiction and nonfiction. Although Alice is the narrator, leading the way to her discoveries in her family’s garden, two chickens provide the science concepts in informative sidebars. This is an absolutely gorgeous and well-researched book. Highly recommended! When I lent this one to someone and never got it back, I knew I had to go out and buy another copy. This book is really one of a kind. The photographs are exceptional, although they do have a flower fly identified as a honey bee, which is a common mistake. The website has good information, too. You can see what it is about in this video. For fans of Linnea’s Garden (see fiction section below), this gardening how-to is a useful introduction to indoor gardening. It is written in a cozy, journal style. Lydia Grace Finch isn’t used to living in the city, let alone with her dour uncle. Can she work miracles with a small suitcase full of seeds? This classic picture book reveals how planting flowers can make a difference. Discovering the joys of the school garden helps lonely Michael make friends. If you are interested in art, artists, Monet, nature, gardening or traveling to Paris, this is the book for you. Definitely inspires me to want to grow a “Monet Garden” of my own. Beautiful, sweet, and informative, I keep our copy with the art books, but it wants to be with the nature and gardening books, too. Twelve-year-old Kate helps Berneetha turn a vacant lot into a community garden, gathering help and friends along the way. Can they protect the garden when the lot owner decides to build on it? 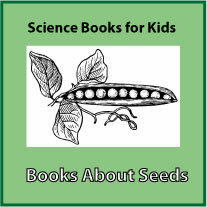 List of Children’s books about seeds. What is more inspiring than space? If you are doing a science theme about space or the solar system and are looking for books for children, you’ve come to the right place. (Note: Linked titles go to Amazon for more information. Please see the disclaimer below). The titles are organized by reading level. 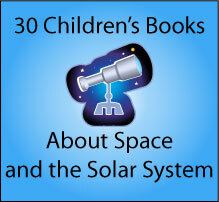 Space (Smithsonian Little Explorer) by Martha E. H. Rustad is a quick introduction to topics ranging from the moon and planets to the Big Bang. Colorful photographs and eye-catching illustrations help keep interest and put things in perspective. See how many Earths placed on top of each other would equal the height of the sun. Fascinating! Comets (Heinemann First Library: the Night Sky and Other Amazing Sights in Space) by Nick Hunter explains how these bits of dust and ice orbit the sun in our solar system. Starting with ancient records of comets, Hunter describes some of the most famous comets and how they were discovered, He concludes with an activity using balls and a playing field to help children conceptualize the vastness of space. Show Me Space: My First Picture Encyclopedia (My First Picture Encyclopedias) by Steve Kortenkamp is a visually-stimulating way to learn about our sun, the planets, moons and even far away galaxies. Stars and Constellations (Heinemann First Library: The Night Sky: And Other Amazing Sights in Space) by Nick Hunter explores what stars are, where they come from, what makes them shine, what people thought of them in the past, and how we study stars today, starting with the nearest star, the Sun. A fun activity is provided along with advice on viewing stars. Eclipses (Heinemann First Library: The Night Sky: And Other Amazing Sights in Space) by Nick Hunter (Author) examines both solar and lunar eclipses, as well as eclipses on other planets. The book covers what an eclipse is, what eclipses can look like, how they happen, what people thought of eclipses in the past, and how they are studied today. He concludes with an activity, along with advice on viewing eclipses. Northern Lights (Heinemann First Library) by Nick Hunter covers some of the coolest phenomena we can see without a telescope: the Aurora Borealis or Northern Lights. He explains what they are, what they look like, where they can be seen, and how they are caused. Readers also learn about the significance of solar storms, the Southern Lights, what people thought about auroras in the past, and how they are explored today. As with the others in this series, he concludes with a fun activity. Combining spare, imaginative text with denser scientific explanations, this book has potential for a multitude of uses. It can be a lovely bedtime book, the basis for a language arts lesson, or a great accompaniment to a lesson on the solar system. Salas must inspire her illustrators to greatness, because Jaime Kim’s art positively shines. If You Were the Moon is a must have for budding astronomers and poets everywhere. Visit Laurie Purdie Salas’s website for downloadable teaching guides (long and short versions) and other goodies. In her usual lightly humorous style Hartland reveals how a piece of the Peekskill meteorite ended up on display at the American Museum of Natural History. This book is the third in a series in which Hartland uses a cumulative story technique borrowed from “The House that Jack Built.” Here she explains where the meteorite came from, who saw it, and what the owner of the car did when she discovered the damage, etc. With the the change in 2006 from having nine planets in the solar system to only eight, children may be wondering what happened to Pluto. Why isn’t it a planet any longer? Pluto’s Secret: An Icy World’s Tale of Discovery by Margaret Weitekamp, with David DeVorkin, and illustrated by Diane Kidd uses a whimsical approach to explain the discovery of Pluto, its history and how scientific classifications change as we uncover more information about the world around us. Explains the most recent view (2011) of the planets in our solar system, with eight planets in the classical sense and five dwarf planets. At 128 pages, this is a big book! Even though it exceeds the usual length, let’s keep it in the picture book section because of the fabulous illustrations and the reading age level. Moonshot: The Flight of Apollo 11 by Brian Floca is an extraordinary book. You can tell the minute you open it and see the front endpapers, which have exquisite, detailed illustrations of Apollo 11. Another book to commemorate the 40th anniversary lunar landing, it is also well done. Look to the Stars by Buzz Aldrin and illustrated by Wendell Minor is remarkable because it is much more than merely an account by the second human being to touch the surface of the moon. Dr. Aldrin shows us how this incredible accomplishment is part of a long history of discoveries and advancements, and how it may lead to many more new things in the future. This title is about the constellations you can see in the night sky. Because it is illustrated by Felicia Bond (Give a Mouse a Cookie), it has a different look than some of the others that come later in the series. Explores the premise that someday people may visit, and even live on, Mars. A history of the Hubble Telescope and overview of how the images it has captured have added to the field of astronomy. Although written for middle grades, it is also useful for adults wishing to brush up on the topic. Have you ever wanted to visit the laboratory of a ground-breaking research scientist? Now you can, because Planet Hunter: Geoff Marcy and the Search for Other Earths by Vicki Oransky Wittenstein will allow you to feel like you are standing right next to Dr. Geoff Marcy in his quest to find extrasolar planets (planets that revolve around stars other than our sun). Full color cut-away illustrations show the ins and outs of space vehicles past, present and future. Fast-paced autobiography of Dr. Edgar Mitchell, who went to the moon in 1971 on Apollo 14. Although obviously a must-have resource for future astronauts, Earthrise is also likely to appeal to those interested in history, science, engineering, and aviation. It is a revealing look at how one man’s sense of adventure took him places that the rest of us can only imagine. Full review at Growing with Science. Illustrator/author O’Brien takes the reader on an imaginary trip to a colony on Mars in the future. Scientific details and photorealistic illustrations, as well as second person narration, draw the reader into the story. It is not 100% accurate, but is a 100% thrilling ride. Are you ready to try science poetry now? 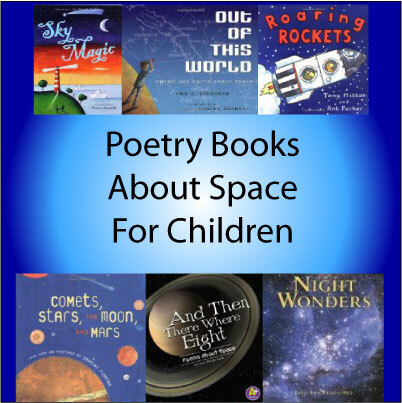 Check out our list of space and astronomy poetry books for kids. 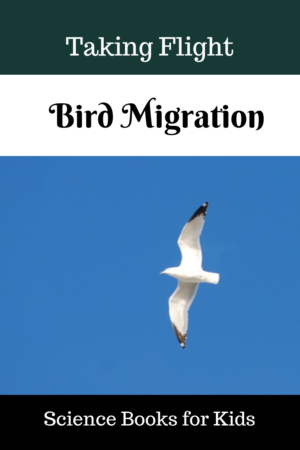 Fall and spring are wonderful times to introduce children to the idea that birds migrate. 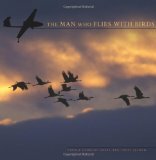 Pair some great nonfiction with fiction to celebrate the seasonal flights of birds. (Note: Linked titles go to Amazon for more information. Please see the disclaimer below). The Let’s-Read-and-Find-Out Science series offers consistently high quality children’s science books. This title covers what starts birds on their migrations and some of the common migration pathways. Although the bird in this nonfiction book migrates long distances, one important stop on the way is Delaware Bay were it refuels on horseshoe crab eggs. Same type of bird that s featured in the middle grade book Moonbird (see below). Flying from Alaska to Argentina, the peregrine makes an 8,000 mile journey during its migration. Based on the flight of an actual bird followed by the U.S. Fish and Wildlife Service. Did you know that snow geese fly from their Arctic nesting ground to the New Mexico desert where they spend the winter? Follow the flight of the bar-tailed godwit from Alaska to New Zealand. Some of the birds fly an amazing 7000 miles without stopping! Perfect nonfiction to pair with Baba Didi and the Godwits Fly below. Dr. Rob Bierregaard ( Dr. B. as he calls himself in the book) studies osprey migrations. One August he captured an osprey he named Belle on Martha’s Vineyard in Massachusetts. He fitted her with a radio transmitter. After he released her, the transmitter sent her location data to a computer so he could study where she went. That fall, Belle flew all the way to the rain forests of Brazil. In the forward Dr. B. explains that “this is a mostly true story.” Belle really made the flight to Brazil and he knew her location at different times, but he used creative nonfiction techniques to fill in details about her experiences and the dangers she faced. His descriptions of her daily activities are lush and detailed. Readers learn a lot about all the places Belle visits. Belle’s Journey is likely to appeal to youngsters who enjoy reading fiction as well as to those who want to find out more about ospreys and bird migration. In 2013, large numbers of white owls started showing up in lower Canada and along the east coast of the United States where they weren’t normally seen. Why were snowy owls migrating to new places? Sandra Markle used her research skills to track down experts and find the answers. What she discovered was that the snowy owls were experiencing an irruption, which means they migrating beyond their usual range, because their populations had swelled the previous summer. She also found out why, which I won’t reveal here. Like Belle in the story above, some of the scientists used GPS transmitters to follow the birds. The book is filled with amazing photographs of beautiful snowy owls. An older book, it tells the story of the Pacific golden plover, which is a tiny shorebird that migrates from Alaska to Hawaii. In addition to illustrations of birds flying, this book also includes colorful maps of migrations and ranges. The bird of the title or “Moonbird” is also known as B95 because that was the number he was banded with in South America in 1995. A male shorebird commonly called a red knot, he is called “Moonbird” because he has been documented to have flown an estimated 350,000 miles – over the distance to the moon and halfway back – in his lifetime! Yossi Leshem studied bird migrations over Israel, in part to prevent bird strikes on airplanes. Amazing footage of geese and other birds flying through the air, filmed using ultralights that are moving right with the birds. If you like birds, this one shouldn’t be missed. Baba Didi of the title is the narrator and Isabella’s grandmother. When they discover brown shorebirds called bar-tailed godwits feeding on the beach near their home in New Zealand, Baba Didi explains how the birds make a migration flight all the way to Alaska each year. The reader soon learns Baba Didi made an equally perilous journey when she and her husband left Croatia when they were young and sailed all the way to New Zealand. Flute is a wood thrush that migrates from Maryland to Costa Rica and back. Also following a wood thrush, the story centers on a boy in New England and a boy in Central America, each of whom treasure their experiences with the same bird, but don’t know the other exists. Just one look at the cover, and you know this is a special children’s book. It follows a ruby-throated hummingbird’s migration from Michigan to Costa Rica. 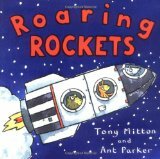 If you are doing a science theme about space or astronomy and are looking for books for children, don’t forget to include some books of STEM poems. Night Wonders by Jane Ann Peddicord won the 2006 International Reading Association Children’s Book Award. It combines poems about space with stunning photographs and artist’s renderings of space. Peddicord also includes some informational text to fill in and emphasize the facts revealed in the poems. A Rocketful of Space Poems chosen by John Foster and illustrated by Korky Paul is a collection that features poems from the likes of J. Patrick Lewis, Eric Finney, and Judith Nicholls. Many of the poems are not particularly serious, since they feature monsters, witches, magicians and aliens. They allow the reader to “fly into space, drive to the moon, meet an asteroid dog and a flurb blurp, and then play intergalactic Squibble-Ball.” As you can see, the featured poems are highly imaginative but have a science-based foundation underneath. Out of This World: Poems and Facts about Space by Amy Sklansky and illustrated by Stacey Schuett (2012) really lives up to its name. The poems are fun, creative and absolutely perfect for kids. For example, in the poem “Zero Gravity” some of the lines are flipped over. How creative! Each poem is accompanied by a black sidebar labeled “Fact” that explains scientific concepts or fills in the history of events that are mentioned. You could teach a robust unit on STEM poetry with just Douglas Florian’s fabulous books. 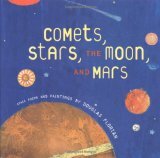 Comets, Stars, the Moon, and Mars: Space Poems and Paintings (2007) is probably the one most geared to older children. Personally, I love Florian’s playful style and fun-filled illustrations. In this book there are cut out circles in some of the pages that move images from one page to another, some playing with changes in scale while doing so. For example, the planet Mercury is a cut out that reveals the much larger Venus on the page behind it. Sky Magic (2009) compiled by Lee Bennett Hopkins and illustrated by Mariusz Stawarski presents the sun, stars and moon from an interesting, earthbound perspective. Hopkins has collected poems from a variety of poets and organized them to flow from sunrise to sunset. A wonderful celebration both the skies and poetry. The Universe Verse by James Lu Dunbar is for middle grade readers. Are you ready to try science poetry now? Do you have any favorite poetry books about space that aren’t on the list? We’d love to hear about them!